Built on a full size slide and frame. Made from Parkerized Carbon Steel. The 5 inch Match grade barrel is made from Stainless Steel with a polished finish on the flat surfaces and a matte finish on the rounded surfaces. 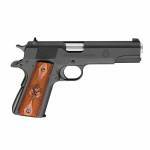 The mainspring housing is the original arched style that is found on the 1911-A1 (G.I. Issue) but includes the Springfield ILS. Standard spur hammer and standard grip safety. Fixed Combat 3-dot sights. Comes with a pair of Cross Cannon emblazoned Cocobolo grips. Frame Finis.. 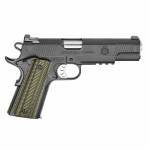 The .45ACP Range Officer® has the same quality forged national match frame and slide as the Trophy Match™ and TRP™ 1911s. It gets the same precision fit as these pistols, too. 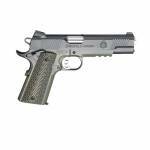 Add in the same match grade stainless steel barrel and bushing, and you have a pistol that shoots well beyond its price tag. 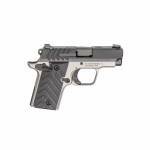 The .45ACP Range Officer® is topped with a fully-adjustable rear target sight, so you have maximum flexibility. 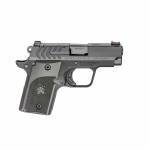 The beavertail grip safety, extended lightweight trigger and flat mainspring housing al.. Forged steel frame and slide is coated in a highly corrosion-resistant Black-T finish and precision fitted to a Match Grade stainless steel barrel with fully supported ramp. Accessory rails allow attachment of lights and lasers. 3-dot tritium nightsights, featuring a tactical-rack rear in the 5” version. Octo-Grip™ front strap and mainspring housing texturing with G10 VZ Grips® assure a confident hold. 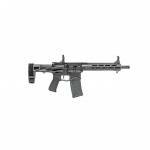 Ambidextrous safety and SA Gen 2 Speed Trigger with a 4.5- to 5-pound pull deliver custom-g.. When the police are minutes away and the threat is seconds away…9-1-1…When you have to be you own first responder. 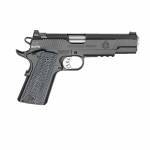 Springfield Armory’s 911 .380 is the perfect pistol for your EVERY day carry. The lightweight 7075 T6 aluminum frame and Titanium steel slide measure 5.5 inches long and less then 4 inches high, with a snag-free profile that’s undetectable under clothing. Springfield’s Octo-Grip™ front strap texturing ensures a secure grip and is complimented by a G10 Octo-Grip™ textured mainspri.. When the police are minutes away and the threat is seconds away…9-1-1…When you have to be you own first responder. 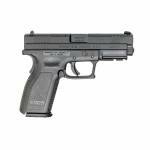 Springfield Armory’s 911 .380 is the perfect pistol for your EVERY day carry. The lightweight 7075 T6 aluminum frame and black Nitride or stainless 416 steel slide measure 5.5 inches long and less then 4 inches high, with a snag-free profile that’s undetectable under clothing. Springfield’s Octo-Grip™ front strap texturing ensures a secure grip and is complimented by a G10 Octo-G.. The 911 both shoots and feels like a full-size firearm, encouraging both practice and daily carry in the most concealable firearm that Springfield currently offers. It's small frame shooting with the familiarity of a 1911. The lightweight 7075 T6 aluminum frame and 416 steel slide measure 5.5 inches long and less then 4 inches high, with a snag-free profile that's undetectable under clothing. 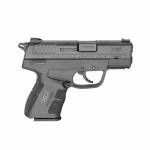 Designed for life-saving defensive use at close range, the 911 features an ambidextrous safety and is pe..
SPRINGFIELD INC 4" Service Springfield Armory XDD9101HC XD Service 9mm 4" 16+1 Polymer Grip Black The 4 inch XD combines safety with quality and ease of use. 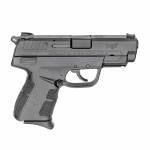 With the Ultra Safety Assurance (U.S.A.) action trigger system, this polymer framed pistol is as comfortable as it is safe. 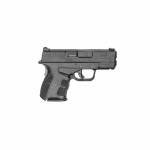 Includes 1 - 16RD magazine and cardboard box SPECIFICATIONS: Mfg Item Num: XDD9101HC Category: FIREARMS - HANDGUNS Type :Pistol Ac.. In the post-War years, as 1911s became increasingly common in the civilian market, shooters and custom shops found new ways to upgrade their .45s. Uncle Sam’s original spec sheet was a one-size fits all. But the 1911-loving public quickly figured out that America’s favorite autoloader could be improved with customization. The Loaded Series from Springfield Armory® brings you the culmination of those lessons. These pistols are Loaded with all the features a 1911 should have. Whether you’re loo.. The flat top design is optics ready and includes a flip-up rear aperture sight and A-2 fixed front sights. The 16-inch Chrome Moly Vanadium barrel features a 1:8 twist rate. Mid-length gas system is paired with a heavy tungsten buffer resulting in an exceptionally smooth action.The SAINT features micro-polished and Nickel Boron treated components. Includes top notch furniture designed to improve shooting experience and operator performance. 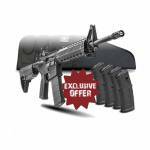 Exclusive Bravo Company PKMT KeyMod handguard packs hea.. The SAINT AR-15 Pistol in .300 BLK harnesses the power of the battle-proven round for more capability and versatility in a compact platform. 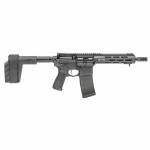 Complete with a rugged SB Tactical SBX-K forearm brace and a 9-inch Melonite treated CMV barrel, the SAINT AR-15 Pistol is small, fast, and ideal for CQB. 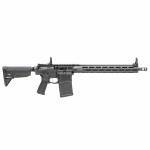 The patent-pending free float handguard design, nickel boron-coated GI single-stage trigger, pinned, low-profile adjustable gas block and exclusive Accu-Tite tension system complete this compact, comba.. The SAINT Edge Pistol combines the most popular features of the most premium ­SAINT in the lineup with the compact shootability of a pistol platform. With the same features that make the SAINT Edge a premium rifle, the SAINT Edge Pistol in 5.56 allows for maximum portability and ease of use in close quarters. The lightweight billet-machined lower receiver compliments the patent-pending full-length free float handguard, and the 10.3” lightweight 1:8 twist CMV barrel creates a comfortable, quic..
At just 7.8 lbs the all new SAINT VICTOR .308 hits like a ton of bricks without the weight of a traditional AR-10. Purpose built to offer serious power in a quick handling configuration, the SAINT VICTOR in .308 features a 16" light weight barrel, M-Lok free float hand guard and included flip-up sights. Never a victim, always the VICTOR. 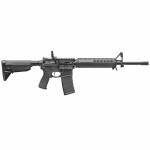 Caliber: .308 WIN Length: 37.75" Fully Extended, 34.5" Collapsed Weight: 7lbs 11oz Upper Receiver: Forged Type III Hard Coat Anodized, 7075 T6 Alumi.. The XD-E sculpts unmatched Point And Shoot ergonomics into a sleek single stack frame that is just an inch wide, for hand and holster fit so satisfying you’ll take it everywhere. The low-effort slide practically racks itself, so handling is a pleasure. The exposed hammer clearly shows gun mode, and the single/double action trigger shows respect for your shooting style, unlike other compacts. The GripZone provides active texture that improves your stability. New shooter or skilled gunner, wr.. 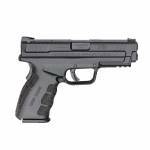 The Springfield Armory XD-E sculpts point & shoot Ergonomics into a sleek polymer frame just an inch wide, for ideal hand and holster fit. The Low Effort Slide (L.E.S.) requires 27% less effort to manipulate compared to striker-fired handguns in the same class. The exposed hammer clearly shows gun mode, and the single/double action trigger shows respect for your shooting style, unlike other compacts. Its GripZone provides active texture that matches your grasp like a handshake, improves stabilit.. 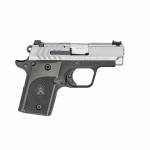 The latest edition of Springfield’s most popular pistol is engineered in a slim, single-stack frame, holding 6 rounds of .45 ACP and offers upgrades from the inside out. The XD-S Mod.2 features a higher hand position, enhanced grip texturing, thinner slide, an Ameriglo® Pro-Glo™ front sight with tactical-rack rear sight, and an enhanced trigger that advance this polymer-framed pistol’s acclaimed “point and shoot” ergonomics. 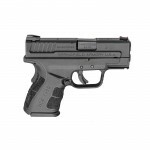 Other features include a loaded chamber indicator and a grip safety tha..